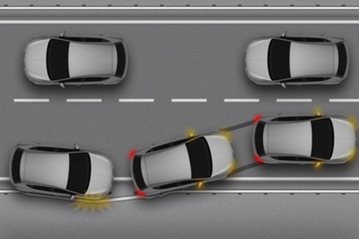 SEAT’s Multi Collision Brake is a system that applies the brakes to prevent or mitigate a subsequent impact when a vehicle has been involved in a collision. If the airbag is fired in response to a primary collision, information is sent to the electronic stability control system to brake the vehicle. If the braking system is sufficiently intact to brake safely and effectively, the vehicle is automatically slowed down at a rate of 6ms-2 to a speed of 10km/h so that a secondary impact, for instance against another vehicle or roadside object, is avoided or at least less severe. During braking, the hazard warning lights and brake lights are illuminated and the hazard lights remain on after the braking has stopped. In the event of a serious primary collision, the driver will probably be unable to control the vehicle and Multi Collision Brake acts autonomously to reduce speed safely. Nevertheless, if the driver detects that braking after the initial impact is itself hazardous (for example, increasing the risk of being struck by following traffic), the system can be over-ridden by depressing the accelerator pedal. It is estimated that around a quarter of all accidents involve multiple collisions. Secondary collisions can be especially injurious as many of the protection systems, such as airbags and pre-tensioners, have already been deployed in the primary collision and are unable to provide further benefit. Moreover, the vehicle structure may be compromised from the initial impact and less able to absorb the energy of secondary collisions. Multi Collision Brake reduces the likelihood of such secondary impacts, and makes those that happen less severe. It is estimated that, if all cars were equipped with a system like Multi Collision Brake, around 8 percent of fatalities and 4 percent of serious injuries could be addressed each year. City Safety is turned on by default at the start of each new journey but can be switched off by the driver. If it switched off, the system defaults on again at the beginning of the next journey. If the braking system is seriously damaged in the initial impact, Multi Collision Brake will not act as safe braking cannot be guaranteed. However, the electronic stability control ECU is located close to the firewall in a well protected area and braking systems are designed so that one pair of diagonally opposed front and rear brakes can provide safe braking, so it is likely that the system will be able to help even if there is extensive damage. On very low friction surfaces, the full 6ms-2 braking may not be achieved and the full benefit of Multi Collision Brake may not be realised. Extensive use was made of HiL (hardware in the loop) and SiL (software in the loop) to develop and test the Multi Collision Brake system. Track testing involved simulating an airbag deployment electronically and checking to see that the required conditions were met, both in high and low friction conditions. In addition, test drivers covered almost a million kilometres to ensure there were no false activations. The system was also independently tested by a Euro NCAP laboratory.